Does a very good job at keeping you dry, even in the torrential rain. I was tired of getting wet all the time after purchasing supposedly waterproof clothing, but after looking on the MCN website this item came up trumps for me. Can't rate it enough. One of the best out there on the market, get the same size. Excellent, genuinely waterproof. Got the M for 5'9. Happy with the product and top service. I brought this so I can protect myself from rain and it does just that. I find myself dry after my commute to work in the rain and due to being hi vis, drivers see you more which makes it's a safety aspect of the product as well as rain cover for your whole body. Very pleased. Will come back again. Does the job looks good the only issue is that it is on a small side. I bought it in Medium and my boyfriend is a skinny guy yet it's a bit tight so I would go for the Large next time. Keeps me warm and dry on a 40 minute each way commute, no matter what the weather. One of my better buys. Suit is well made and the advise in sizing from yourselves and other reviewers was spot on. Yes the waist elastic is a little snug, but it keeps suit under control (no flapping about). As for getting suit into bag provided, I'm going to use it as a Christmas party game if anyone get it in bag a prizes will be offered. Well done RST for keeping standards up, lots of poor quality kit around, this IS NOT ONE of them. Good suit, waterproof to date. Excellent shipping time and service from this company. Will definitely use Sportsbikeshop in future. ADVICE Advisable to go two sizes up from usual size to accommodate normal biking gear underneath. 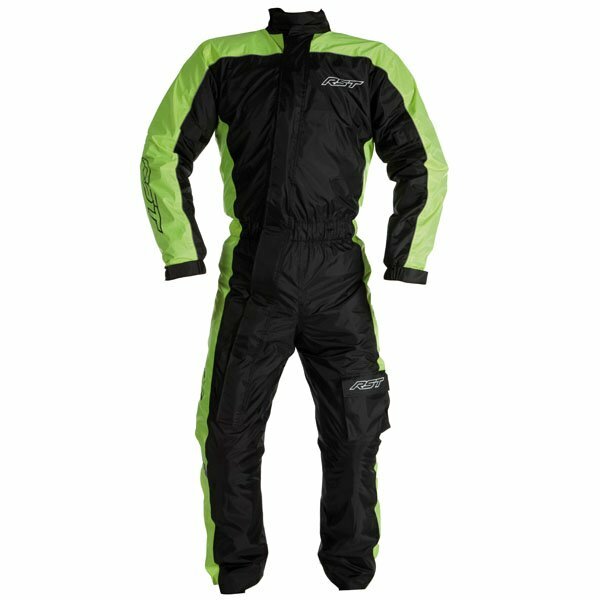 The RST Waterproof suit is a 1pc style waterproof high value for money approach to the problem of what to carry in the backpack on days when the weather is unsettled. The fit is generous enough to fit over all leather or textile suits, jackets or jeans, without race humps. The design allows it to be fitted in a matter of seconds. 3M Scotchlite reflective panels on the arms, back and legs mean added safety when those dark nights approach. Please note that this WP suit does not contain, or have any provision, for protective armour. My jacket has a race hump in it, will this jacket fit but make it tighter or is it designed so it just wont fit over it? This may fit, but the only way to know for sure is to try it - you will need to go at least two sizes up on your normal size. It is advisable to go two sizes up from usual jacket size to accommodate normal biking gear underneath. 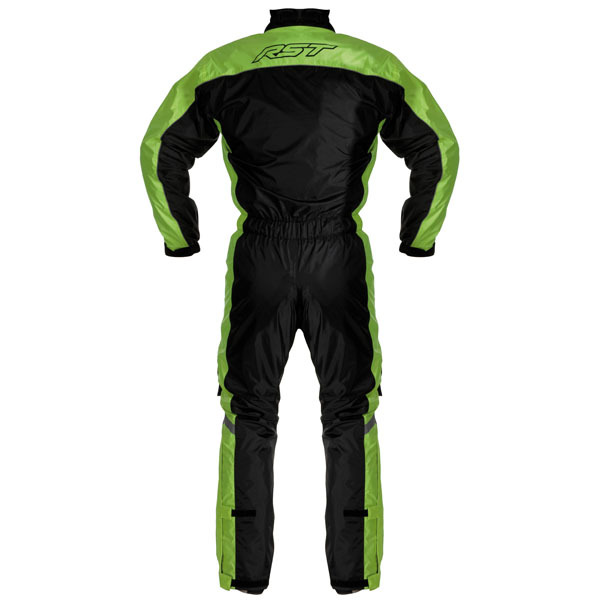 The RST waterproof suit is supplied unlined.